Hey you guys! Have you heard about the 'internet' that's recently become quite popular? (Well you must have done, because you're looking at it right now!) 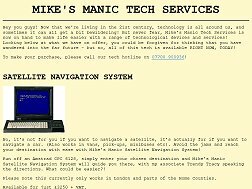 So if you're looking to make the big move into 'Cyberspace', then look no further than Mike's Manic Web Services! Having recently learnt how to use a computer, experienced web designer Mike the Manic Web Designer will be all too pleased to design a quality web site to represent you or your organisation! Just call our hotline now on 07700 900936 to discuss specifications! Any colour you like (bit like Henry Ford!) and any font you like (as long as it's on our computer)! It's all up to you! We promise that no detail will be overlooked! Just call our hotline now on 07700 900936 and we will be all too delighted to make you an offer you can't refuse! (See below for pricing structure). 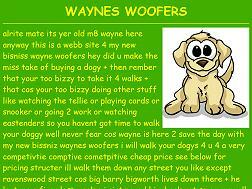 Web design services start at a trifling £725 + VAT for a single page web site, with £300 + VAT for each additional page! It's a steal! (Discounts are available if a Ford Capri is included in your purchase). Come into the 21st century today, with Mike's Manic Web Services! 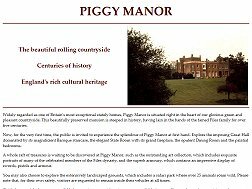 Website designed by Mike's Manic Web Services. Mike's Manic Web Services accepts no responsibility for the content of member websites. Mike's Manic Web Services is in no way affiliated to Mike's Manic Motors where a selection of tasty fast Fords can be had for surprisingly reasonable prices! 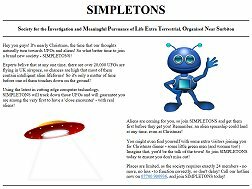 This is a fictional website created as part of Des and Mick Online. Mike's Manic Web Services is not a real web design service or web host, and will not design or host a website for you at any price. The hotline is a fake number. Sorry!